Songstress Beyoncé Knowles has kept mum on reports that she wed rapper Jay-Z six months ago...until now. 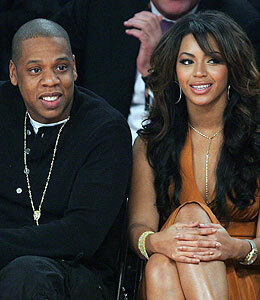 "What Jay and I have is real -- it's not about interviews or getting the right photo op. It's real," Beyoncé reveals to Essence magazine. The singer, 27, spills a few details about her big day -- including the fact that she didn't want an engagement ring! "People put too much emphasis on that -- it's just material and it's just silly to me," she explains. The mag reports that the couple opted for matching tattoos on their ring fingers, reading "IV." Knowles and Jay-Z both have birthdays on the fourth of September and December, respectively -- and the couple said "I do" on April fourth. The Destiny's Child beauty said she opted for an intimate ceremony so she could skip the drama of a huge wedding. "I'm not a traditional woman," she states. "It's been my day so many days already." The pair has been dating since 2002 -- and Knowles admits she knew they would tie the knot one day. "We've been together a long time -- we always knew it would happen."